I admit it. I collect Youtube Channels. That’s not saying I have time to watch them all (right now my Hulu and Netflix Queues are skyhigh – ain’t nobody got time for that!). But still, I love to keep up with the Youtube world. I will admit that I rarely follow makeup/beauty Youtube channels. I really admire women that can have new vlog material that often – but because I don’t buy a ton of high-end beauty products, they rarely interest me. (I will say though, if I am looking for good reviews of a certain product, Youtube is a fabulous place to search!). But, I love learning new things. And I have found a few channels that constantly teach me. You know they say you should learning something new every day? Why don’t you start here! 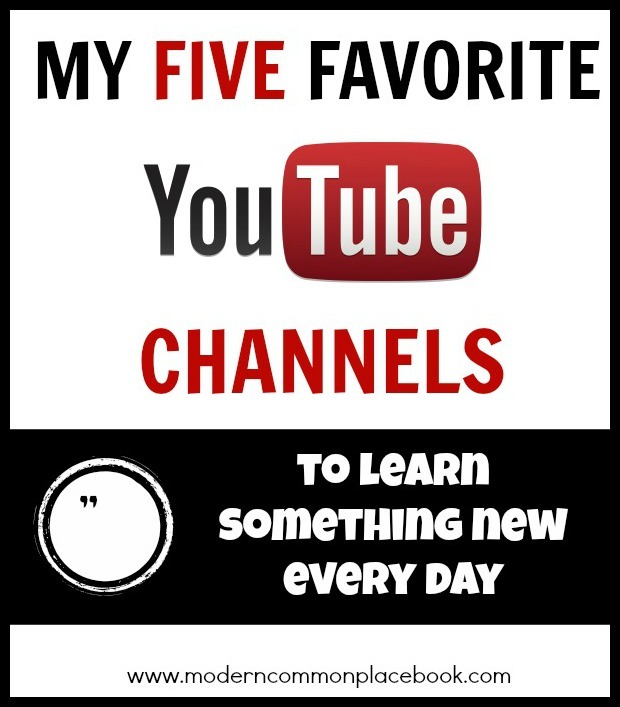 Here are my five favorite Youtube Channels. CGP Grey is like fast-paced education on steroids. His 10-minute or less videos pack SO much fast incredible information in, that I almost miss being in school. Just listen to his voice. You will be hooked. His explanation of the Difference Between the United Kingdom, Great Britain and England? BRILLIANT. I also LOVE the Secret City of London, Holland vs. the Netherlands, Vatican City Explained, and The Trouble with the Electoral College. My husband and I have been known to watch hours of these on end – and even bring them up in public. They are that good! This is mainly for all you bloggers/owners of small businesses out there. I love the site Social Triggers (Online Marketing Strategy), and Derek’s Youtube channel is no different. I have watched TONS of “how-to” videos for marketing, but every time I watch Derek’s I learn something. EVERY TIME. His newsletter e-book changed the way I view my blogging – and his strategies blow me away. I love a good interview. Especially if the interviewer is good. I have found that Huff Post Live gives my absolute favorite celebrity interviews. They are on point, smart, thorough, and incredibly comfortable to watch. And, they have the best interviewers around. I always impressed with their questions and demeanor. I said I don’t like beauty channels, but I really do love the MM&L Show. All of it. Every stinking little laugh. I love their hilariousness, their lightheartedness, and their smarts. I have some of their videos bookmarked because I refer back to them ALL the time! This one is for all you moms/couponers/money-savers out there! If you are only going to learn from one couponing mom, Hip2Save is IT! This girl is awesome. She’s hilarious. She’s smart. She has taught me so much about couponing, saving money, shopping online, and deal-hunting. I think she is hilarious and love every one of her videos.